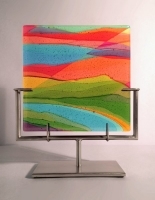 Dorothy Hafner received her BA from Skidmore College, Saratoga Springs, NY, where she also completed her post-graduate studies. 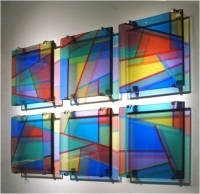 Her colorful, free-standing glass panels and installations are complex pieces embodying the use of color and light in daily function and ritual. 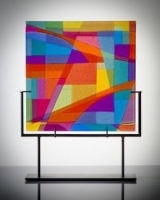 Hafner’s works are in many major collections, including the Corning Museum of Glass, Corning, NY, the Cooper Hewitt Museum, NYC, the Brooklyn Museum, NY, the Musee des Arts Decoritifs, Montreal, the Museum voor Hedendaagse Kunst, Hertogenbosch, the Netherlands, the American Crafts Museum, NY, and the Norton Museum of Art in Palm Beach.